What happens if you're not ready to turn 27? When you feel like your life isn't where you imagined it to be in your youth? I didn't have concrete 5 or 10 year goals, but in my head, I had hoped to make decent progress in life. But then again, what defines someone as successful? It's subjective. One person's success might not mean the same thing to someone else. But I can't help but compare myself to my peers. Some friends I've grown up with are now married, popping out babies, or devoted mothers, and/or own a home. I don't have any of those things. I don't even have a dog (something I hope to change next year--hey look, an attainable goal!). I know that those things don't define you and everyone's timeline is different, but how does that reflect about you? I feel like I haven't traveled enough, I want to eat and drink my way through Italy, stuff my face with platters of fresh pasta made by nonnas with wrinkled hands and sip homemade limonello followed by pistachio gelato. I want to visit New Orleans and blues dance with a hot stranger on the street with a saxophonist crooning in the background. I haven't read enough books! I want to lie on the beach in Santorini and read food memoirs. I want to own my own house and paint the bathroom a brilliant shade of pale turquoise to remind me of the Caribbean ocean, hang up a ton of photos I've taken of my friends and family to show off to my friends and family. I want a bright and open kitchen with grayish white marble countertops and host dinner parties like I used to during my Montreal days. I want to have a golden retriever and call him Brinkley (named after Tom Hank's dog in You've Got Mail) and throw frisbees for him to catch and bring back to me. That's only a tiny glimpse of the many things I want to do. I feel like I'm running out of time. Is it just me? Is this what a quarter-life crisis feels like? Anyway, I made this layer cake for one of my best friend's birthday. I made the cake layers and froze it for a week since I knew there wouldn't be time to make it before her party. I whipped up the frosting which was definitely THE most decadent, buttery, and creamy frosting I've ever made. Other frostings I've made lean towards the sugary side or have sandier texture and who don't the words "Cloud Frosting" just beckon your name? The frosting has a high butter to sugar ratio which makes it uber smooth. I'd prefer a stronger chocolate flavour, but that didn't stop the compliments from flowing at the party. The cake is absolutely amaZING. It's moist and the flavour marries well with the frosting, there's just enough shredded coconut to give it some nibbly texture too. I put plenty of kosher salt in the frosting too because I can't resist that sweet and salty combination. There were no leftovers which made us sad, but I suppose it goes to show just how delicious it was. The cake recipe is from Martha Stewart's Cupcakes via Leite's Culinaria. 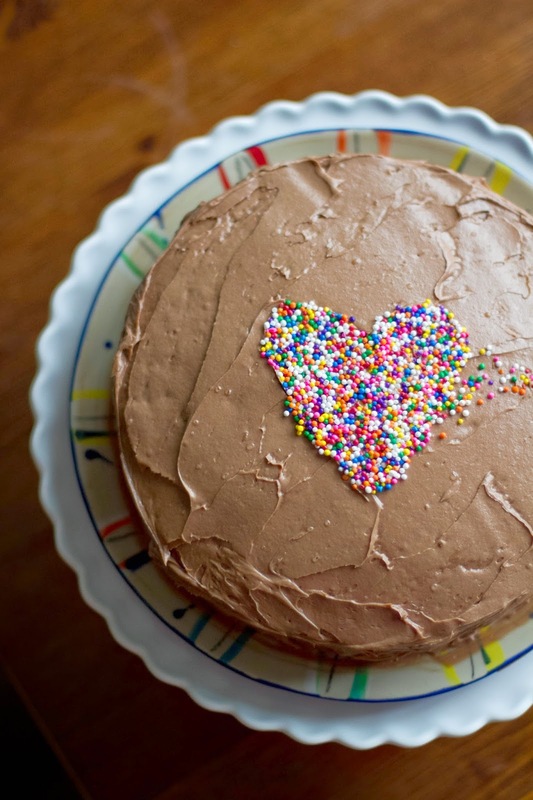 The chocolate cloud frosting was adapted from Sweetapolita. The original frosting uses Nutella, I opted it out but I'm sure it would have tastes even better and chocolatelyier. Preheat the oven to 350˚F (176°C). Line two 9-inch springform or cake pans with parchment circles cut to fit. If not using springform pans, butter and flour the pans. Combine the flour, baking powder, salt, and shredded coconut. Set aside. Combine the coconut milk and vanilla. Set aside. 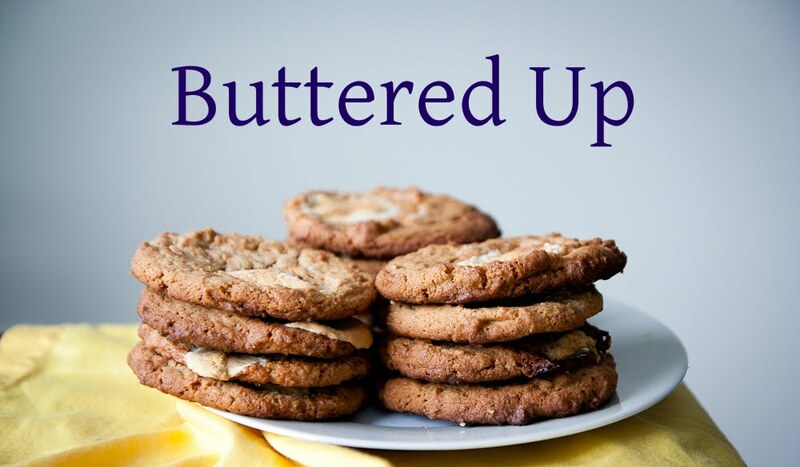 Beat the butter and sugar with an electric mixer until light and fluffy. Add the eggs and egg whites and mix well. Add a third of the flour mixture to the butter mixture, switch to a spatula, and stir just until incorporated. Then add half the coconut milk mixture and stir just until incorporated. Repeat, adding half of the remaining flour mixture, then the remaining coconut milk mixture, and ending with the remaining flour mixture. Do not overmix. Divide the batter evenly among the two pans. Bake until the top of the cake springs back when pressed lightly with a fingertip and a toothpick inserted in the middle of the cakes comes out clean, 25 to 40 minutes (if making cupcakes, figure about 20 minutes). 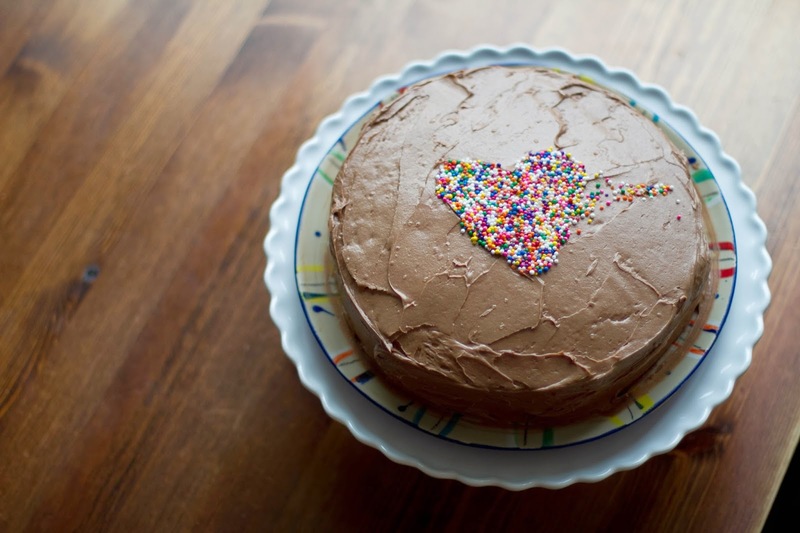 The cake will not color appreciably, so don’t rely on its hue as an indication of doneness. Cool the cakes completely in the pans on a wire rack. Working with one cake at a time, place the wire rack on top of the cake pan and invert the cake onto the rack. Then carefully invert it again so it’s right side up. Repeat with the remaining cake. Using a serrated knife, carefully slice off the mounded portion of one or both cakes to create a flat surface. Add vanilla, and beat on low speed until well combined. Add the melted and slightly cooled chocolate and beat on medium speed until smooth, about 2 minutes. Add the milk and kosher salt, and beat on med-high speed for another minute. 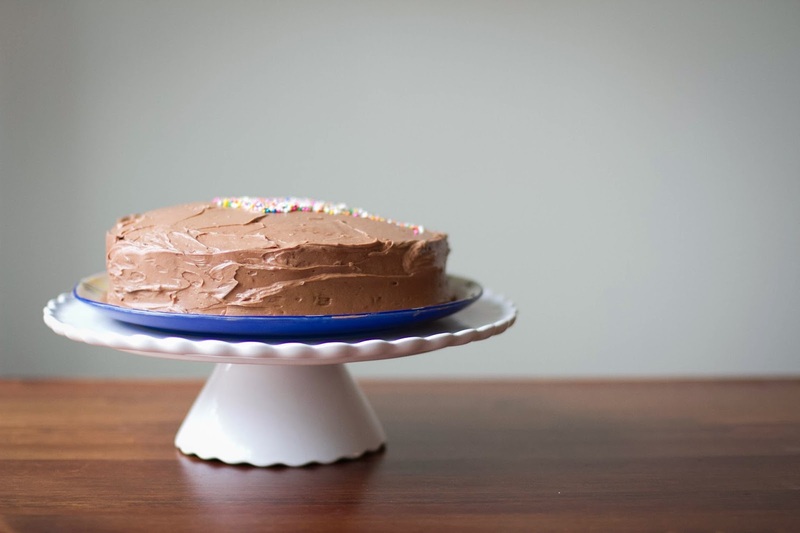 Place a trimmed cake on a cake platter or cake stand. 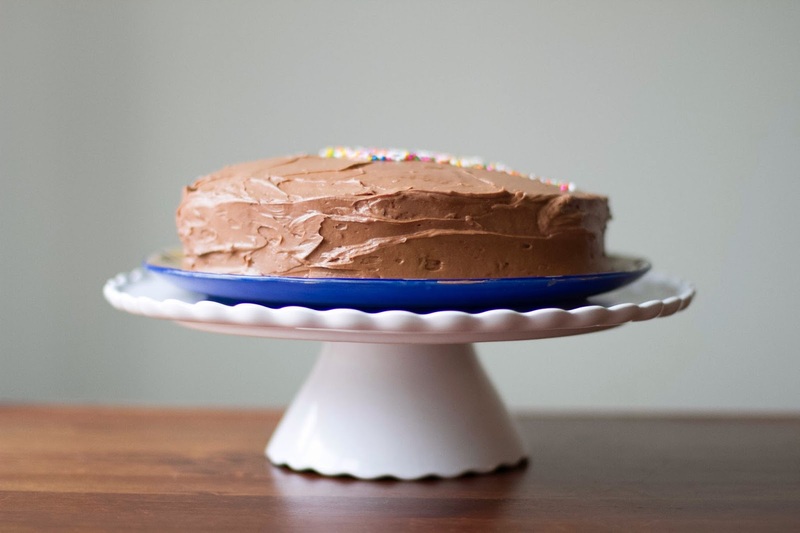 Slather on a generous portion of the Chocolate Cloud Frosting over the top, using a cake spatula, evenly distribute it over the cake. Place the second cake on top of the first and very thinly coat the top and sides of the cake to seal in the crumbs. This is called a crumb coat. Using the cake spatula, generously slather the cake with the rest of the frosting. Cover the top and sides with the frosting. Add sprinkles or shredded coconut to decorate.